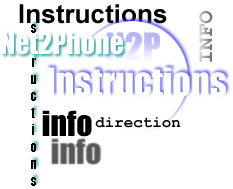 Click here for additional Net2Phone General Information. Yes, Net2Phone allows you to call from your computer to anyone overseas at their normal telephone number. And the rates are fantastic......calls to USA from anywhere in the world will cost only US 10 cents/per min (off peak hours) & US 15 cents (peak hours). Calls to Australia, Canada, UK/England, France, Germany, Netherlands/Holland, Norway, Puerto Rico, Sweden, Denmark, Virgin Islands during any time of the day costs only US 10 cents/min, Denmark for US 12 cents per minute, New Zealand US 15 cents per minute,............just to name a few. Click here to view all of Net2Phone rates.